Each easy-to-make recipe provides preparation time and complete nutrition analysis and exchange information. 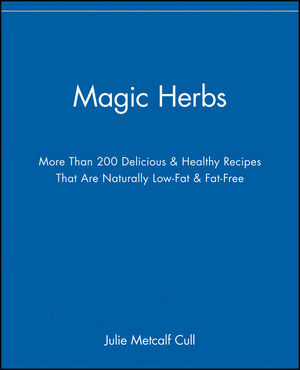 This unique book also features a "dictionary" of herbs, tips on growing and drying your own, and suggestions for using herbs in decorating and gift-giving. Julie Metcalf Cull, R.D., is a consultant dietitian and president of Northeast lowa Dietitians. She is also the author of the Quality Time Family Cookbook (Chronimed). In addition, Ms. Cull is the proprietor of the Parson's Inn bed and breakfast in Glen Haven, Wisconsin. This book is specially bound to stay flat while using. Seafood, Tofu, Poultry, and Eggs.